Musical notes, jazz music, a union jack acoustic guitar, an elegant damask pattern, a retro keyboard and fun musical text designs feature in this collection of acrylic keychains with musical designs. Customise this acrylic keychain featuring gray, black and white musical notes score to create a personalized and unique gift for the music lover in your life. 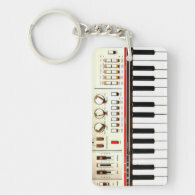 For the lover of the old electric keyboard from the 80's, bring back memories with these keychain featuring a photograph of an old keyboard. Do the memories of your music lessons haunt you? Here is a funny keychain for those who didn't enjoy the experience, "I survived music lessons". Customize this lovely gold music keychain, featuring musical notes on a damask background with a place to personalize with your own text. notes and clef in white on a black background. A collection of acrylic keychains with designs which would make perfect gifts for musicians, music teachers and students, and music lovers. The acrylic keychains come in three different shapes - circle, square and rectangle and can be printed either on one side or both sides.